If you were trying to keep your driveway heating all to yourselves, convinced that no one else deserved such a luxury, then you may be interested to hear that the heated driveway secret is out. More and more homeowners are catching on to the affordable, once thought of luxury of driveway heating. It is easier and more affordable than ever to lay radiant heat cables beneath your driveways and sidewalks. Business owners are catching the wave of heat as well. The secret has spilled into their parking lots and loading docks and even showing up on school properties across the country as well. Radiant snow melting systems are a great way to keep property clear of snow. What was once a little known system has become a staple in winter-laden homes and businesses across the states. 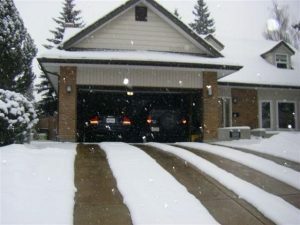 Heated driveways are efficient and require little power to access their heating power. The warmth keeps the snow from accumulating on the pavement and snow and ice danger is minimized with the flip of a switch. The automatic snow sensor keeps tabs on the temperature and snow fall so you never have to get up in the middle of the night to turn it on. The sensor detects those things for you and turns on and off when needed or not. Share the secret that is not so secret anymore with your friends and neighbors and tell everyone about driveway heating. They’ll love you for it. Looking for the A to Z of radiant heating solutions, or somewhere in between? Warmzone offers a full menu of complete radiant heating solutions, and more importantly, they do it well. They have a vast portfolio of industry-leading products and services to choose from. And just like their interest in serving up top notch electric radiant heat and hydronic heating solutions, they take a vested interest in maintaining customer relationships for life. You won’t find better customer service. From your initial contact to your final installation, you’re more than a customer–you’re part of the Warmzone family. As a Warmzone insider, you can expect unbeatable customer service, free installation training, complete design and engineering services, along with installation support before, during and after your home improvement project is completed. How do Warmzone radiant snow melting solutions work to preserve the environment surrounding your home? Electric snowmelt systems utilize durable, highly efficient cable that distributes heat evenly across the surface of your driveway or sidewalk. The cable is rugged enough to be installed in new concrete pours, under pavers and even in harsh, high-temperature new asphalt construction projects, alleviating the need for shovels, snow removal services and snow melting chemicals—all of which can have devastating affects on the exterior of your home, from your lawn to your exterior landscaping. Warmzone ClearZone heating cable is the most popular driveway snow melting cable and features efficient, maintenance free operation and a 10-year manufacturer warranty. Of course, no single radiant heating system is perfect for every type of job. What makes Warmzone more attractive than those “other” radiant heat providers? It’s their ability to match you with the best product for your project at the best price. Warmzone doesn’t partner with just one manufacturer. They carry a variety of top radiant heat solutions for just about any application, allowing them to deliver sincere, non-biased recommendations that best suit your project requirements. Warmzone’s experienced staff is well-versed in each and every one of the products available, and can get you matched up with the best product at a price you can live with. 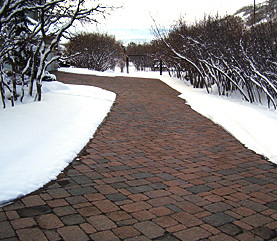 Radiant heated driveways: Warmzone’s ClearZone snow melting system can heat almost any size, shape and type of driveway. By the spool or with the help of pre-configured mats, ClearZone electric radiant heating cable can be installed under just about any surface (asphalt, pavers or a fresh concrete pour). 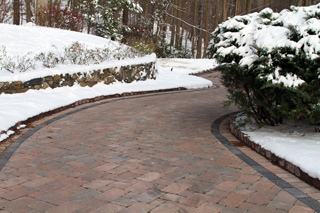 Driveways can even be retrofitted with a ClearZone snow melting system. 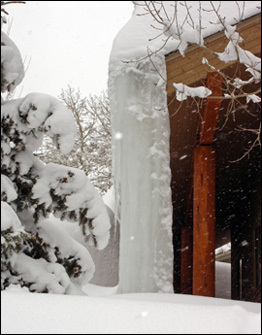 Radiant roof heating and gutter trace systems: These best-in-class radiant heat systems prevent hazardous ice dams and icicles from forming on your roof. They eliminate prolonged ice damming and the severe effects of seepage through roof decking that can work its way inside your home, damaging ceilings, walls and floors, resulting in mold growth. Portable snow melting: WarmTrax portable snow melting solutions, including portable heated traction mats and stair treads, are a great alternative to the permanency of embedded snow melting systems for heating outdoor walkways, ramps and stairs. Made of electrically operated heating elements sandwiched between two protective surfaces of non-slip rubber, WarmTrax heated traction mats are a popular, affordable and very versatile snow melting solution that serve a wide variety of uses. Many of these snow melting products (and projects) are perfect for first-time do-it-yourselfers. If you’re ambitious enough to take on the project, Warmzone is right there to back you up. Not sure where to begin with your next radiant heat project? Warmzone professional designers will evaluate your radiant heating system thoroughly to create a detailed CAD of your system layout. You’ll know the electrical requirements, technical specifications and system performance expectations before one foot of heat cable is installed. You get all the details with minimal installation surprises to save you time, money, and in the end, the heartache of a radiant heat project gone wrong. 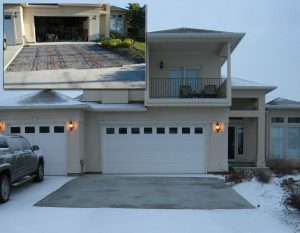 Dennis is just one of many satisfied Warmzone customers able to realize the benefits of a radiant heated driveway. The biggest, of course, is the benefit of not having to worry about snow removal. No more back-breaking shoveling or wallet-breaking checks to the snow removal service. Because, after all, when you can operate the system for just pennies on the dollar without any effort at all, it just makes plain dollars and cents to install a radiant heated driveway. And what about those curious neighbors Dennis describes? It’s actually quite a boon to him if you think about the positive effects such talk might have on his home’s equity. In a word, radiant heat is an incredibly practical way to boost the equity in your home, while making your life easier. And the word is definitely getting around. Ready to see how Warmzone can help you find the perfect fit in radiant heated snow melting solutions? Visit them online at www.warmzone.com or call 888.488.9276 for more information. Forced air furnaces can be loud and inefficient and exacerbate allergies. People still use them and enjoy the heat they provide, but perhaps they don’t know there is a better way to heat your home. After reading this, you will be able to say that you now know about radiant floor heating and the silent, efficient ways it can heat your home. If you’ve ever wanted to quiet the gentle roar of your furnace, lower dust and cut energy costs; you might just find the answer to all those conundrums lies with radiant heated floors. Radiant heated floors are efficient and affordable for all homeowners now. The heat cables generate radiant heat using minimal energy yet producing powerful heating output. The radiant heat warms objects in your room so the warmth permeates everything not just trying to force warm air over cold air. The heating cables are warmed beneath the surface of your floor using power, but are relatively sound free as they go about their heating business. People with radiant heated floors comment that they enjoy how silent the systems operates compared to a rushing, gushing furnace kicking out artificially heated air through inefficient ducts, often through poorly insulated parts of your home. 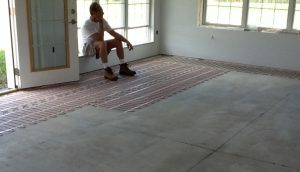 Radiant floor heat offers silent, efficient, affordable heat. Radiant heated floors are nothing new. There are Roman ruins that have radiant heating, proving that radiant heat stands the test of time. Newer products have such great technology that includes radiant heat cables that come with warranties that last longer and longer. Proving still that radiant heat is here to stay and will outlast the homes it heats. Radiant heated floors have long been prevalent and popular in Europe but are rapidly gaining use and popularity across the country. 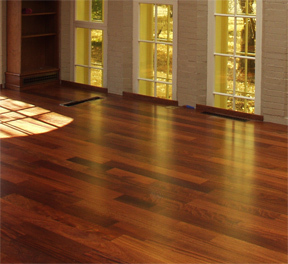 We’ve seen tremendous growth in radiant heated flooring. A typical residential radiant heating system utilizes around 2,000 lineal feet of radiant heat cable. Industry sales have gone from 29.8 million lineal feet of cable in the early 90’s to more than 99 million in the late 90’s. * That is close to a 25 percent growth rate per year, which shows the gain in radiant heated flooring popularity. Some people are installing radiant heat throughout their homes; others prefer to use it in smaller areas like bathrooms or basement family rooms. Rooms with high ceilings are harder to heat so radiant floors are a good choice for these types of rooms as well. The Romans were on to something when they started using radiant heat and we still see benefits. As the technology as become perfected more and more modern day use is proving to be invaluable in home heating. Many homeowners in the Chicago area are installing radiant heated floors for use as their primary home heating source as well as in select rooms to supplement their existing home heating system. As many owners of radiant floor heating systems attest, nothing is finer than walking on a warm floor during a cold winter day. Radiant heated floors are also ideal for rooms where children spend a lot of time playing on the floor. Warmzone offers a variety of electric radiant floor heating systems, as well as hydronic heated floors for homeowners in Chicago and the Midwest. And because Warmzone manufactures and carries the industry’s most trusted floor heating systems, our experts can evaluate your needs and determine the ideal system for heating your specific floor type. Our selection helps to ensure that you receive the most effective floor heating system for the unique layout and floor type of your home. While there are some standout radiant floor heating systems, it is important to know that no single floor heating system is ideal for every type of flooring. That’s why it’s so critical to speak with a provider who can offer you a wide selection of reputable floor heating options without bias towards one system. Don’t be talked into purchasing a floor heating system simply because it’s the only system that the provider offers. Deal with an industry leader that can show you a wide selection of radiant floor heating solutions and explain the benefits and traits of each one. Many homes in the Chicago area feature hardwood or laminate flooring. Warmzone offers several choices for heating hardwood and laminate, but the most popular solution is the low-voltage FloorHeat STEP system. These are just some of the choices Chicago residents have to heat their floors. Whether you’re looking to heat carpet, tile, marble, hardwood or any other type of floor, you won’t go wrong dealing with Warmzone.